The presidential campaign is widely viewed as excessively negative and not focused on important issues. Just 27% of Americans say the campaign is “focused on important policy debates,” which is seven points lower than in December, before the primaries began. Yet dissatisfaction with the campaign and the candidates has done nothing to dampen voter interest in the 2016 election. Fully 80% of registered voters say they have given “quite a lot” of thought to the election, the highest share at this point in any campaign since 1992. Four years ago, 67% of voters said they had given a lot of thought to the election, and at this point in 2008 – the previous election in which both parties had contested nominations – 72% did so. In part, this is a reflection of the widespread belief that a great deal is at stake in the upcoming election. 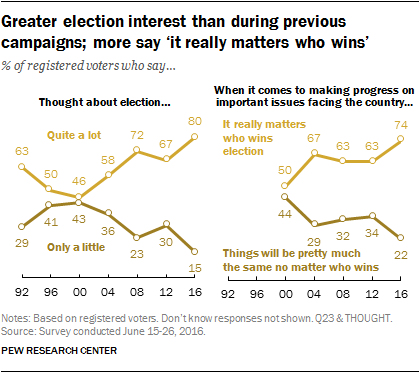 In every campaign since 2004, majorities of voters have said “it really matters” who wins presidential contests, but currently 74% express this view, up 11 percentage points from the same point in the campaigns four and eight years ago. Moreover, most voters simply find the campaign interesting. Currently, 77% say the campaign has been “interesting,” while just 17% describe it as “dull.” The share calling the campaign interesting is nearly double the percentage saying this four years ago (39%) and the highest during any campaign dating back 20 years. The new national survey by Pew Research Center was conducted June 15-26 among 2,245 adults, including 1,655 registered voters. In a two-way contest, 51% of registered voters support Clinton or lean toward her, while 42% support or lean toward Trump. In a three-way contest, including Libertarian Party nominee Gary Johnson, 45% favor Clinton, 36% support Trump and 11% back Johnson. As has been the case in recent campaigns, there are stark racial and ethnic differences in candidate support. Trump leads among white, non-Hispanic voters (51%-42%), while Clinton has an overwhelming advantage among African Americans (91%-7%). In another sign of voter discontent, large numbers of the supporters of both Trump and Clinton view their choice as more of a vote against the opposing candidate than an expression of support for their candidate. More than half of Trump supporters (55%) view their vote more as a vote against Clinton, while just 41% view it more as a vote for Trump. Among GOP candidates since 2000, only Mitt Romney has drawn as much negative support (58% of Romney supporters saw their vote more as a vote against Barack Obama). Clinton’s supporters are divided – 48% view their vote more as a vote for their own candidate, while 50% say it is more a vote against Trump. But that is the highest share of a Democratic candidate’s supporters viewing their choice as more a vote “against” the opposing candidate dating back to 2000. In 2008, just a quarter of Obama’s supporters said their vote was more a vote against John McCain than a vote for Obama. The survey finds that Clinton is widely viewed as more personally qualified and possessing better judgment than Trump. A majority of registered voters (56%) say the phrase “personally qualified to be president” better describes Clinton than Trump; just 30% say the phrase better describes Trump. Far more voters also say the phrase “would use good judgment in a crisis” better describes Clinton (53%) than Trump (36%). However, neither candidate has an advantage on honesty: 40% say the phrase “honest and truthful” better describes Clinton, 37% say it applies more to Trump and 20% volunteer that it better describes neither candidate. Within their own parties both Clinton and Trump are viewed more negatively by voters who supported other candidates in the primaries than by their own primary backers. For instance, only about half (47%) of Democratic and Democratic-leaning voters who preferred Bernie Sanders for the Democratic nomination say the phrase honest and truthful better describes Clinton than Trump. About a third (35%) of Sanders supporters say this description fits neither candidate, while 16% say it better applies to Trump. Among Democrats who supported Clinton for the nomination, 83% view her as more honest and truthful. While the vast majority (82%) of Republican voters who supported Trump for the GOP nomination say the phrase personally qualified to be president better describes Trump than Clinton. However, just 49% of Republicans who backed other candidates for the party’s nomination say the same. When it comes to the issues at the forefront of voters’ minds, the economy tops the list, with 84% of voters – and similar shares across most demographic and political groups – saying it is very important to their vote. Terrorism also ranks high across the political spectrum. Other issues are seen as more important by backers of one of the candidates: Trump supporters are more likely than Clinton supporters to say immigration is very important to their vote (79% vs. 65%), though the importance of this issue across-the-board is substantially higher today than it was in 2008 or 2012. Conversely, though nearly eight-in-ten (79%) Clinton supporters view the treatment of racial and ethnic minorities as a very important issue to their vote, only 42% of Trump backers say the same. And while more than half of Clinton supporters (54%) say the treatment of gay, lesbian and transgender people is very important, just a quarter of Trump supporters agree. Clinton is viewed as better able than Trump to handle several issues, including dealing with race relations (66% to 26% over Trump), better reflecting people’s views on abortion, making wise decisions on foreign policy, dealing with health care and selecting Supreme Court justices. Yet voters are divided over which candidate can better handle the economy and terrorism – the two issues that rank at the top of voters’ agenda. Trump has a wide edge over Clinton as being better able to reduce the influence of lobbyists and special interests in Washington (50% to 30%). Young voters highly engaged, but unhappy with choices. Nearly three-quarters of voters younger than 30 (74%) say they have given quite a lot of thought to the election, which is higher than at this point in 2012 (59%). But only about a quarter of young people (23%) are satisfied with their choices for president. 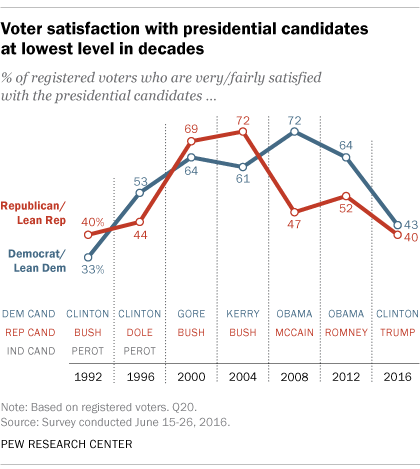 At this point in both 2012 and 2008, more than twice as many voters younger than 30 said they were satisfied with their candidate choices (60% in 2012, 68% in 2008). Trump viewed as candidate of ‘change,’ not necessarily for the better. Fully 77% of voters say Trump would change the way things work in Washington, compared with just 45% who say the same about Clinton. 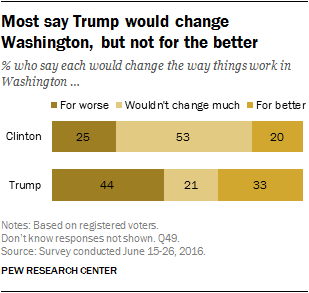 But more voters say Trump would change things for the worse than for the better (44% vs. 33%). A quarter of voters say Clinton would change Washington for the worse, while 20% say she would change things for the better. Many see daylight between Trump’s positions and those of average Republicans. About half of all voters (51%) say average Republicans generally disagree with Trump on most issues, while fewer (42%) say they generally agree with Trump’s positions. By contrast, 72% of voters say average Democrats agree with Clinton on most issues. More think Clinton’s gender will help than hurt her. More voters think the fact that Clinton is a woman will help her (40%) than say it will hurt her (12%); 45% say it won’t make much of a difference to voters this fall. There are only modest partisan differences in these opinions, but men overall are somewhat more likely than women to say that Clinton’s gender will help her (45% vs. 35%). 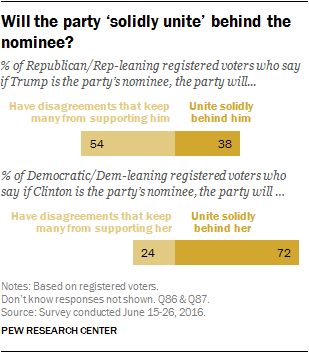 Republicans remain skeptical that their party will unite behind their presumptive nominee. Just 38% of Republican and Republican-leaning registered voters say the party will “solidly unite” behind Trump; 54% say disagreements in the party will keep many Republicans from supporting him. These views are virtually unchanged since March, amid the GOP primary contest. By contrast, 72% of Democratic voters say their party will solid unite behind Clinton; in March, 64% expected their party to unite behind Clinton if she became the nominee. Immigration is a top voting issue for Latino voters, second only to the economy. As is the case among all voters, the economy is among the top issues for Hispanic voters: 86% say it is very important to their vote. But Hispanic voters are about as likely to say immigration is very important to their vote (79%). This is on par with the shares naming health care (82%), terrorism (80%), education (78%) and foreign policy (74%) as very important voting issues. Hispanic voters rate most issues similarly to the overall voting population.